In this year's E4 seminar, we want to transform desert outskirts and sparsely populated desert regions within Peru into habitable and productive habitats by the intelligent use of existing resources and the application of low-tech based strategies. Therefore, we will design in all connecting scales: From the object to architecture towards the landscape. Peru's coastal strip lies in the rain shadow of the Andes and is influenced by the cold Humboldt Current of the Pacific. This unique combination results in almost no precipitation and extreme dryness, while the air is unusually humid. At the same time, Peru faces social, economic and political challenges. In this year's E4 seminar, we want to address these different agencies and show how they can be creatively combined into a synergetic, innovative whole. A sensitized awareness of the problem should enable a positive reinterpretation of the prevailing conditions through the development of creative design solutions. We will design context-related, architectural prototypes, which use the climatic peculiarities to ensure a self-sufficient water supply, laying the foundation for new and inclusive living environments! How do architectures look like that embrace the manifold challenges of the environment and even transform deficiencies into abundance? In the Master Studio “From Object to Field”, we will unfold the creative performativity of future ARCHITECTURES. In this future-focused studio approach to architecture we will think inclusively! In immersing in local microclimates and social networks, we will develop ARCHITECTURES that shift from singular objects to “field conditions”. As the emphasis on the object often negates the complexity of living systems – we will focus on alive social connections, varying climate and site conditions, and social processes that constantly are emerging and are in formation. In the Master Studio “From Object to Field” we want to answer the questions: What are the ARCHITECTURES of performative field conditions? How can ARCHITECTURE embrace the temporality of a given site? How does ARCHITECTURE adjust its atmospheric conditions due to climate and changing program? And how can ARCHITECTURE and LANDSCAPE symbiotically perform as microclimatic instruments, in applying the advances of future technologies and system thinking? To give answers to these questions, we will focus on Portugal – and on the specific context of the urban district Marvila – Lisbon’s newest creative hub. We will expand the task of designing a Community and Interpretive Centre (3000 m2) to become more than the design of a mere object: we will experiment, think and practice how architecture can perform in enhancing the district’s social, economic and environmental and climatic qualities. Let us turn from one to the many, from individual to the collective, from mono-functional objects to living and multidimensional fields! The Master Studio “From Object to Field” takes part in the University Award Competition of the 2019 Lisbon Triennial of Architecture. 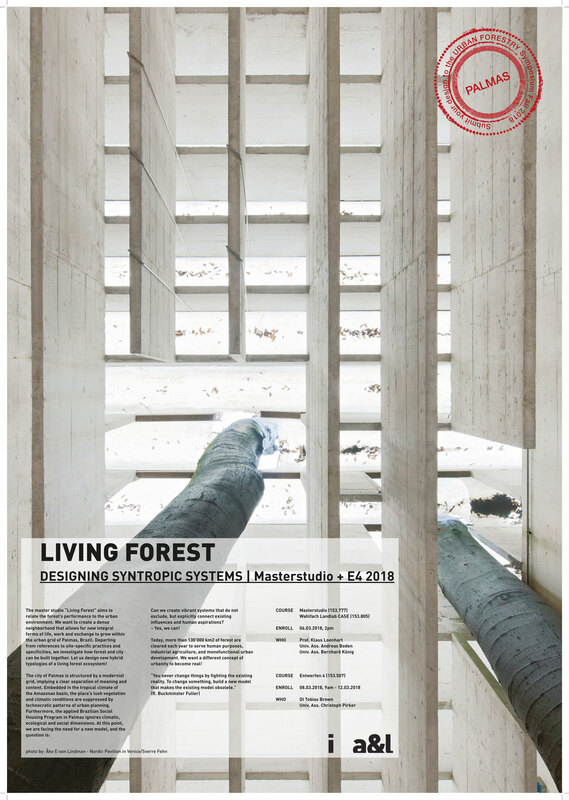 The aim of the Master Studio "Living Forest" is to relate the performance of the forest to the urban environment. We want to create a dense neighborhood that enables for new integral forms of life, work and exchange to grow within the urban grid of Palmas, Brazil. Based on references to site-specific practices and specificities, we investigate how forest and city can be built together. Let us design new hybrid typologies of a living forest ecosystem! The city of Palmas is structured by a modernist grid, which means a clear separation of meaning and content. Embedded in the tropical climate of the Amazonas basin, the lush vegetation and climatic conditions of the site are suppressed by technocratic patterns of urban planning. Furthermore, the applied Brazilian Social Housing Program in Palmas ignores the climatic, ecological and social dimensions. At this point, we are facing the need for a new model, and the question is: Can we create vibrant systems that do not exclude, but explicitly connect existing influences and human aspirations? – Yes, we can! Today, more than 130’000 km2 of forest are cleared every year to serve human purposes, industrial agriculture, and non-functional urban development. We want a different concept of urbanity to become reality! The Pacific Ocean is the largest and deepest ocean and covering 35% of our planets surface. Seeming far off the edges of our global maps, the Pacific however is home to mayor environmental challenges. Island Systems and Archipelagos – entire nations such as Kiribati or Tuvalu – are facing extinction due to permanent flooding caused by rising sea levels. At the same time major garbage patches out of plastic waste already form islands, whose surface areas are today bigger than France. Furthermore, the Pacific Ocean is shaped and surrounded by a ring of geological plate boundaries and volcanoes, that regularly lead to earthquakes and tsunamis. On the cliffs of San Francisco Bay with a very sensitive ecosystem – this Studio will focus on the contextual design of a research and information center for this vast maritime ecosystem. The context-driven integral projects of student teams will participate in the international student competition “Architecture at Zero”. For us, Architecture at Zero means setting the count to Zero - everything is negotiable! Building in the bay not only means embedding a structure in the ecosystem, but will also become a part of it. The new maritime center will act as an interface, connecting the findings of researcher with the experiences of the visitors to an integral whole. The approach of Integral Design also includes basic requirements; to design a self-sufficient system with zero energy consumption and to replace all plastics with renewable materials. Life in the tropics is strongly influenced by the weather. In this setting, we will be working on alternative architectural typologies that embrace the conditions of tropical climate. The studio will explore the possibilities to create architecture that is: THERMODYNAMIC, PRODUCTIVE, SOCIAL PRACTICE, GROWING, and designed as ARCHITECTURAL LANDSCAPE. At our site in Palmas, Brazil, the humidity changes dramatically throughout the year while the temperature remains constant around 30°Celsius. Conditions like these have certain restrictions, but also allow a form of architecture that is more open than in colder climates. Open to a cooling breeze, the lush vegetation and people, this approach allows architecture to merge with it's surrounding environment. Based on the principles of thermodynamics, different spatial layouts and organisations are created. The vegetation can also actively cool spaces by evapotranspiration and thus be used as design tool. With the corresponding seminar LANDLAB CASE - we will conduct research and analysis of the context and study buildings that have incorporated some of the principles mentioned above. In the DESIGN STUDIO, the students then design a highly contextual building with specific programmatic overlays – integrating housing, public services or collective workspace - each type of function will then find its place and application on site. The goal of the studio is to enable students, to view architecture as a unifying and integrative practice. The landscape in Palmas, is in many ways strongly influenced by one element, which is water. Rain and dry season dramatically change the climate throughout the year, vegetation and power generation as well. As an underlying denominator, we will use water to frame concepts for a new waterfront park. Palmas, a city founded in 1990 as the capital of the new state Tocantins, has a rather short history, but carries the legacy of a much older example of modernist urban planning. Like the capital Brasilia, the streets were dug into the bush land in a 700m long block (superquadras). In 2003, a hydroelectric power plant was built to generate electricity, and the emerging water reservoir not only suddenly formed the new edge of the city in the west, but also made it very attractive for sport and leisure. Between the city and the lake, there is still land that offers the possibility of creating a green infrastructure that could serve the city in many ways. In the first phase we will conduct research and analysis of the location and the context, which we will supplement with the information and impressions obtained from the field trip to Palmas. In order to develop a holistic strategy/ masterplan for the respective location at the lakeshore, we will undertake in groups. Each group will investigate a specific topic (narrative) and bring this information to the team and into a design. We see this project as an unique opportunity to test strategies for landscape - based urbanism, that overcomes the modern divide between cities and the landscape. With an integral approach, we see this future waterfront park as a show case to create a multifunctional and resilient public infrastructure. The ia&l will investigate the tactical and relational potential of our architecture of the European landscape. As most architects are increasingly concerned with urbanization, Koolhaas argues why he sees our vast and rapidly changing landscapes as an opportunity. In addition to his architectural work with OMA, Koolhaas also heads its sister organisation called AMO, which conducts research and gathers information that feeds into both his and those of his clients. The studio “SuperFood Architecture” uses this as an opportunity to offer an extravagant alternative: one that is both healthy and local; one that allows the ingredients of our exotic taste and superfoods to be grown in communities where such plants would not grow naturally. With such cultivation in the landscape, we will find new relationships with infrastructure and energy resources such as regional waste heat. More than 20 percent of the earth`s surface is occupied by deserts. Their continuous expansion makes essential agricultural areas become inefficient and thereby withdraws the livelihood of millions of people. Rural exodus and new forms of migration, as well as climate refugees are the increasingly dramatic results. Just this September, US Secretary of State, John Kerry, reminded us: „You think migration is a challenge in Europe today because of extremism, wait until you see what happens when there‘s an absence of water, an absence of food, or one tribe fighting against another for mere survival!“ Desertification has long been regarded as anthropogenic, i.e. caused by human actions. Since the 1970s, there have been promising projects, which focus on making deserts urban again and affecting the weather on site. Through cooperative afforestation projects in Africa, i.e. decreasing soil temperature, wind currents change and rising precipitation. Through collective actions and innovative resilient projects, desert areas in Africa can be transformed into flourishing agricultural areas and to future-oriented model regions. „The future belongs to Africa, because it seems to have happened everywhere else already?“ says Okwui Enwezor. While the population in Europe gradually becomes older and less, the African continent is experiencing enormous growth. By 2050, the population is expected to double to up to two billion. Nevertheless, about 60 percent of young Africans live without their own breadwinning. In the context of the Masterstudio Super.dry: Starting from the desert in Africa, the specific living conditions will be investigated on the basis of the physic landscape. 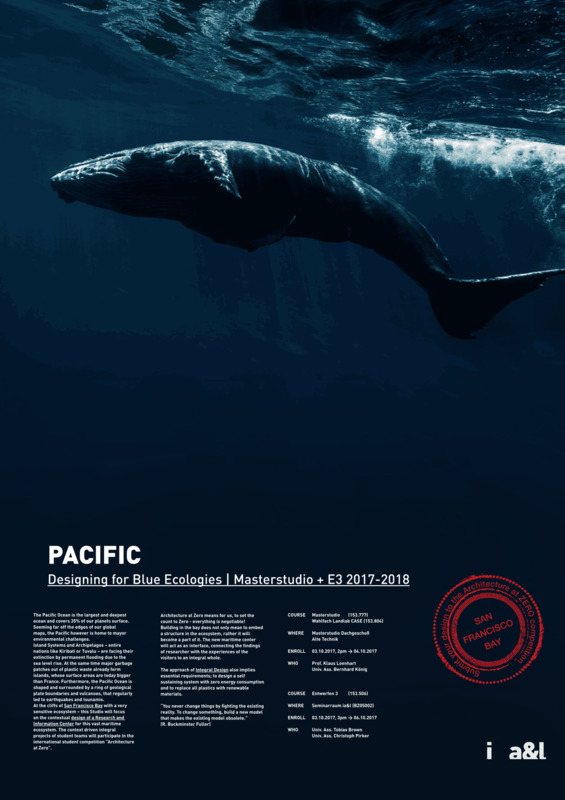 Geology, climate conditions, local resources and social structures along the 15th latitude from Dakar to Sanaa will be the starting point for the design of prospective practices. The aim of the Masterstudio and Entwerfen 3 is to formulate architectures in the ecosystem relation to deserts and to promote the integration of simple, innovative technologies and cooperative local practices to develop resilient systems.